This is a screenshot I pulled off Facebook. I kind of/sort of know some of these people. Not well, but in a distant Facebook kind of way. They are busking in a local town and having a handstand competition, but who they are and what they are doing is kind of immaterial for my post. I bring it up because I want to be able to do this. 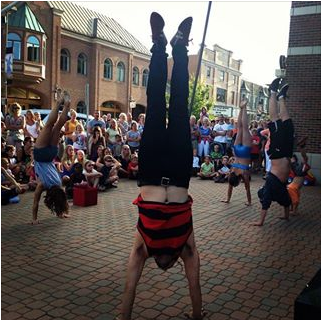 Not busking… handstands! I’ve never done a handstand. (Well, except under water.) The thing is, I’m not just working out to rack up miles on my running shoes. I want more than stamina, speed and endurance. Running is helping tremendously with those, but that isn’t all I want. I also want power, strength, flexibility, and balance. Though I have been writing a lot about running, that’s just because it is my focus right now. I am also currently reading New Rules of Lifting for Women, and have been doing some strength training. (I plan to do more – hence the book.) But, its gorgeous outside and I want to be out as much as possible, so it makes sense to focus on running now, rather than say, in December. I posted a little smart-assed pic the other day about being in the best shape of my life by 2014 and said I am already there. It’s true. I am in the best shape of my life. But I want more. These are things I never knew I wanted, but now I do. Losing weight got the ball rolling, but this is about more about who I want to be than what I want to look like. To learn a lot more about weight lifting – then use what I know! These are my goals, (so far.) It’s all doable, I know that. It will just take time, effort, and, in some cases, a bit of money. I have no deadlines, this is not a “must do by the end of 2014” list or anything like it. It is me, just knowing what I am working towards. This entry was posted in Health and Strength and tagged Change, Feeling Good, Future Plans, Goals, Health, Motivation, Running, Strength Training, Weight Loss by GRLife. Bookmark the permalink.